Child Evidence Briefs are authored by invited experts in the field, and are designed to summarize leading scientific evidence to inform policy decisions and improve the lives of children and families. For more information, contact Martha Zaslow, Ph.D., Director for Policy, at mzaslow[at]srcd.org. In treating opioid addiction, moving from an individual approach to a family-focused approach to treatment can have lasting benefits for children and parents, and decrease health care costs. In 2017, the U.S. Department of Health and Human Services declared opioid addiction a public health emergency. Opioids—which include prescription medicines for pain relief, synthetic drugs such as fentanyl, and heroin—lead to an average of 115 deaths by overdose per day in the United States. Read more. Food insecurity, or not having access to enough food to live an active, healthy lifestyle, affects one out of six households with children and nearly one out of three households headed by single mothers in the United States. 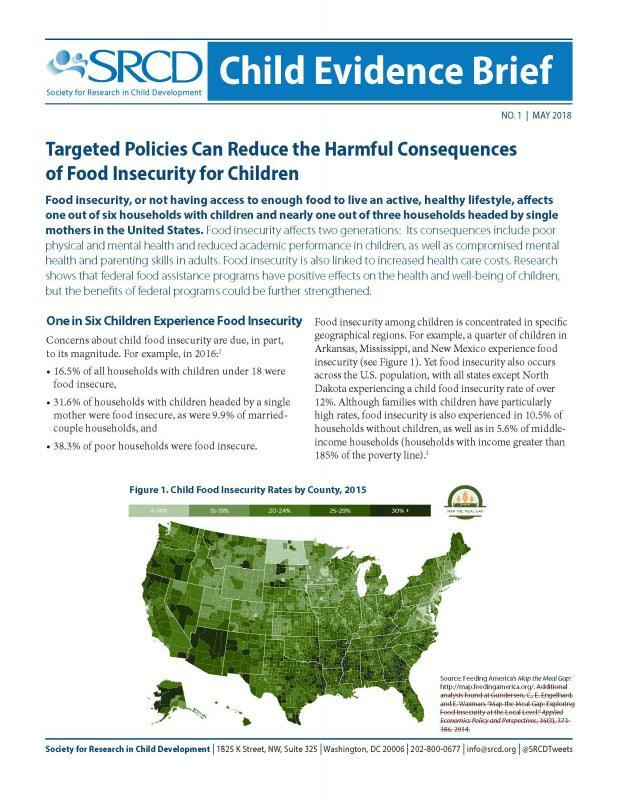 Food insecurity affects two generations: Its consequences include poor physical and mental health and reduced academic performance in children, as well as compromised mental health and parenting skills in adults. Read more.